For those seeking more adventure than a leisurely stroll, you’ve got Mount Garfield northwest of Palisade. This bold promontory in the Bookcliffs has an elevation of 1,900 feet from the roadway. Hikers have a choice between two paths that lead from the same trailhead. Take Palisade Exit 42 and turn south for a short distance. Turn west on 37 3/10 Road and travel for about 2 miles until G 7/10 Road. Go through the I-70 underpass and park. There you’ll find the Gearhart Mine Trail, which detours to an old coal mine and tramway. This trail is 1/2 mile longer than the Mount Garfield Trail, which is about 2 miles. Both trails have steep ascents. To access the top of the escarpment, you’ll find a gap in the upper cliff face about 1/2 mile east of the summit. 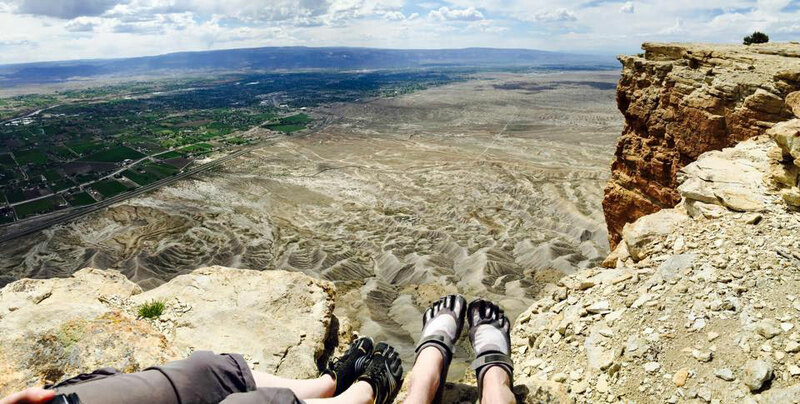 This is a strenuous hike but the payoff is great with stunning views of Palisade and the Grand Valley. A third option to hike Mount Garfield in Palisade is to hike from the backside at the Coal Canyon starting point. This trail has a steep ascent but not as much as hiking from the front. To get to the trailhead, drive east of Palisade on I-70 and exit at the Cameo exchange (Exit 46). Cross the Colorado River and drive past the power plant 1 1/2 miles to a signed entry gate. This trail requires high-ground clearance and is only open from May 30 through December 1.